Ever since I discovered Chow & Chatter I have been a big fan of Rebecca’s site. I mean, what is not to love about a mother and nutritionist doing her best to feed her growing family delicious, healthy food?! Like Rebecca, as a home cook I strive to create delicious and accessible family food that appeals to the foodie in all of us. I love the small scale and intimacy of home cooking, and have always subscribed to the adage “food is love.” Whenever I cook for family and friends I strive to create savory meals that convey warmth and happiness from my kitchen. The Naptime Chef™ started because of the birth of my daughter. Nothing throws a wrench in your cooking style like the arrival of a baby, and I was no different. I love to cook and bake, but with an infant I had no time or energy! I would start thinking about dinner at 4:30pm and, totally overwhelmed by the prospect of cooking from scratch, end up ordering delivery instead. It was awful. About three months after she was born I started “reworking” my favorite recipes to figure out how I could make them while she napped and complete them in the evening. After all, my tastes hadn’t changed, I still wanted to eat and make good food! Once I figured out how to make all my favorites I was thrilled. Shortly thereafter I went to playgroup and told my friends about the lasagna I had recently made, they looked at me like I was crazy. I realized that they were struggling with cooking at home while caring for their young children, so I started The Naptime Chef™ to help them. I purposely publish recipes that can be prepared ahead of time and completed in the evening, or whipped up on a moment’s notice. I want all home cooks to get excited and realize that is possible to cook delicious food with children at home, you don’t have to give up being a foodie just because you are a parent! Remarkably, many adults with grown children have told me that my work has reminded them of the joys of home cooking, and has motivated them to get cooking again. 1. Preheat oven to 350. Grease 2 (two) 9 x 5 inch loaf pans, or one large loaf pan. 2. Sift together flour, baking soda, baking powder, salt and cinnamon into a bowl. 3. In a separate bowl stir together eggs, oil, applesauce, sugar, zucchini and vanilla. Make sure it is fully combined. 4. Carefully pour flour mixture into egg mixture, stirring until completely combined. 5. Pour entire mixture into loaf pans, making sure there is an even amount of batter in each. 6. For Zucchini Bread bake for 40 minutes or until set in the middle. Kelsey, thanks for telling us about your blog. I love zucchini. Your zucchini bread sounds delicious! Thanks for sharing with us. I am so excited you posted this recipe since I was planning on making a choclate zuchini bread soon. We made cookies this weeked so I will wait a few days. I hate having competing backed goods around since I hate to have to throw anything away. 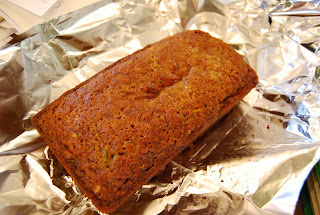 Delicious zucchini bread, thanks for sharing Kelsey! Thanks everyone! I am so glad you like the post. I love working with Rebecca and hope you all enjoy the recipe! Hi, i am in Durham (NC), nice to meet u dear! Great post,good to find out all about you. This bread sounds yummy - moist and healthy. So nice to see bloggers guesting and I love you both so would love to exchange anytime!! Such a wonderful bake!Thank you for sharing! will pass all your comments along to the one and only Kelsey aka naptime chef! So many great comments, thank you. Enjoy the bread, it is great for adults and children alike! Your Zucchini Bread looks yummmo!! Love your nickname...My son is now 5mths old, and I too have become a naptime baker! I've been doing LOTS of crockpot meals and cooking on the weekends, but baking usually happens during naptime since the timing is too crucial!